Two years ago, 11-year-old Ilia Rivera’s grandmother got sick and was hospitalized. Her mom Karen reached out to get afterschool help for babysitting. She got much more when she enrolled in a program funded by the CASE for Kids Partnership Project. The Partnership Project is a locally funded collaboration between Harris County Department of Education’s Center for Afterschool, Summer and Enrichment, or CASE for Kids, the Houston-Galveston Area Council, the Texas Workforce Commission and local afterschool sites like Ilia’s school: Houston Independent School District’s Park Place Elementary. The 20-year-old program is unique because multiple partners–local, state and federal–contribute funding. The Partnership Project fills funding gaps with a variety of resources. The CASE for Kids lending library provides curricula, educational games, sporting equipment and STEM-based materials like robotics kits. Vendors specialize in academic focus areas that highlight math and language. Social and emotional learning skills help children to understand and manage their emotions. In Karen Amaya’s Latina culture, kids stay with family members when parents are working, so the notion of afterschool was a bit hard to accept. After Ilia’s abuela (grandmother) got well, she remained in afterschool and has been busy with activities like robotics, art, tennis, choir, cooking and academic tutorials. CASE for Kids is an afterschool intermediary which provides resources, training and afterschool services for over 9,000 students in greater Harris County. “As CASE for Kids celebrates its 20th anniversary, we look to the Partnership Project as one of the ways we expand our reach to local families and the education communities we serve during times when public school budgets are lean and federal funding for afterschool is diminished,” said Lisa Thompson-Caruthers, CASE for Kids director. Ilia likes the time she gets to socialize with her friends after 3 p.m. and admits she would be on her electronic devices, otherwise. Her mother likes the community environment offered through afterschool at her neighborhood school in southeast Houston. 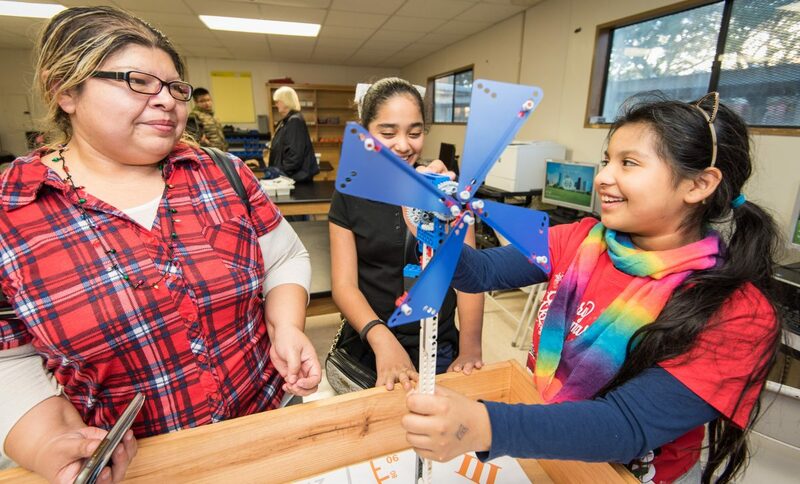 Teacher and afterschool robotics coach Yasin Puertas took Ilia and her classmates to Ecobot Challenge last year, a large-scale CASE for Kids robotics competition funded through the Education Foundation of Harris County, a nonprofit which provides support for education initiatives. Puertas’ team of students won first place in the competition. Last month, Puertas brought a robotics show-and-tell to parents at a local PTA meeting at Park Place. “Parents were literally in tears because they were watching their children who are doing engineering as fourth and fifth graders,” the afterschool coordinator said. “These are future engineers, and they don’t have to have the money to study. They have the brains and the will. Ilia likes to show off her afterschool art project, a multi-media art piece with a motorized arm she engineered with a robotics kit from Puertas’ afterschool robotics class. She says she likes to build things and see them work. Though the preteen cherishes the time she spends with her grandmother and other family members, she also craves the afterschool time she gets with classmates and teachers to build creativity. “Think of plain vanilla ice cream,” Ilia said, illustrating her analogy by circling the air with her hands to fashion the mountain of sugary goodness. To learn more about the CASE for Kids collaboratives, go to www.hcde-texas.org/after-school or call 713-696-1331.